Did you know that even a one-second delay in your page loading speed has a huge impact on your conversion? The same goes with making the checkout process too complicated and too long. Here’s why. According to Baymard Institute, 3 out of 10 potential customers complete a purchase when shopping online. This is not what you, as an online merchant expect, right? Assuming that the other seven will never come back to your website, there are only three buyers left whom you can turn into frequent customers. What you need to do is just provide a memorable customer experience. Easy to say, but how do you do this? It’s a common truth that people nowadays are more likely to choose online shopping over a brick-and-mortar store. It’s more convenient, faster, and usually cheaper, as we can compare prices on the go to find the best deal. All this without staying in long lines. So, why are people leaving their carts so often? The same Baymard study shows that one of the main reasons for card abandonment is a too long or complicated payment process. Another reason is forcing customers to create an account or hiding the total order costs. As you may guess, it’s all about user experience. People also abandon carts when they are confused, for instance, by having too many distractions. In general, the more steps during a transaction, the less chance to convert an almost-buyer into a customer. Imagine that you need to visit the grocery store just to buy some spinach. You’re going down the vegetable aisle and then you’re hit by a sudden offer for rainbow candy floss, frozen chicken nuggets, diapers, and many other things you don’t need to make your perfect spinach pie. A bit frustrating, don’t you think? And now imagine your customers’ reactions when you’re displaying them irrelevant offers across the website or during the checkout process. See the point? 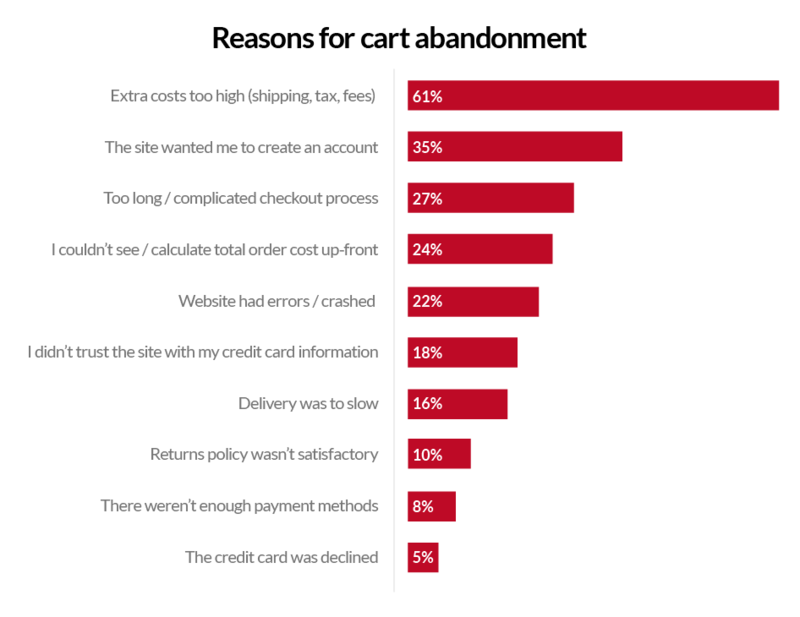 You can find much more reasons why shoppers abandon their cart and tips on what you can do to reduce it in a blog post about cart abandonment. Merchants need a payment solution, such as SecurionPay, that will make them deliver secure payments with UX designed to decrease the number of abandoned carts. Find out what others say about our service. People expect better experiences from technology, and this is also the reason why traditional retailers are struggling and e-commerce is booming. I bet you know the feeling of waiting in a line, experiencing the long drawn out process during the checkout. In online shopping, time is of the essence. If the site doesn’t load fast enough, especially when you’re not the lucky one with a huge dose of patience, you’ll drop it like a hot potato. One of the Dynatrance studies shows that more than half of online users won’t wait more than 3 seconds for a page to load. It also reported that those who averaged a 0-1 second response time on a product page were converting at a rate of 25% compared with a conversion rate of 10% when the page speed took longer than 10 seconds. One second doesn’t sound like a deal breaker but it could have a huge impact on the bottom line. According to research by Radware, a 2-second delay in load time during transaction results even in 87% cart abandonment rate. Imagine how much it can cost you a year. If you do nothing to improve the page load speed, you’ll give shoppers a great reason to buy from your competitors. Your checkout process should never hinder conversions. Checkout is the most critical part of the conversion process and no one likes to be forced to register, especially when they want to buy only one item. With SecurionPay Checkout, you can provide shoppers with a guest checkout option with one-click payments for those who want to just hustle through the buying process. And don’t worry, even with a guest checkout, you still have access to some customer information, so you can use it for future marketing. The heart of SecurionPay’s payment solution is user experience with a strong focus on conversion. It comes with a process reduced to a minimum number of clicks and form fills, and without redirects. You manage payments with simplified user flow and through a solution with design and security features built to minimize cart abandonment and increase sales. For your revenue development, you can simply add cross-sales to your checkout and serve timely, relevant items right after the initial transaction and allow customers to buy them with a click. All this to help you get your customers “over the line”. What’s more, we developed a solution that allows 3D Secure verification without hurting conversion. While your customers enjoy smooth and safe transactions, your business is secured thanks to our built-in machine learning technology that detects fraud and fraud patterns and marks charges as suspicious or fraudulent as soon as they’re made. Here’s more on how SecurionPay Checkout works. Find the balance between speed, functionality, and efficiency to keep customers on your checkout page and make them complete a purchase. Use our APIs to fully control the integration process and set any payment scenario that accurately fits your business needs. For more payment tips and explainer videos, visit SecurionPay Academy, the secret weapon for your business.